The Easy and More Effective Way to Floss, the Waterpik Aquarius Professional Water Flosser is the most advanced water flosser ever. 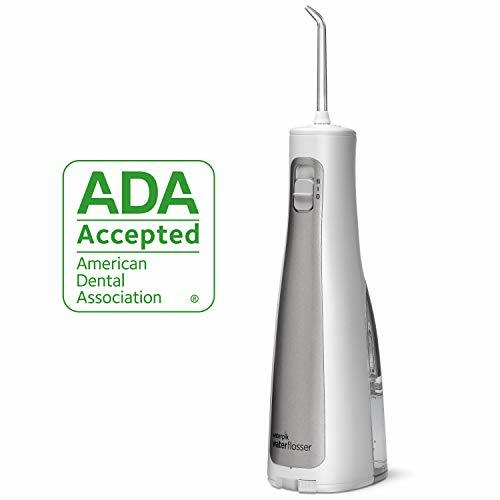 And it is the first dental water flosser in its class accepted by the American Dental Association (ADA). It cleans deep between teeth and below the gumline where traditional brushing and flossing can't reach, using a unique combination of water pressure and pulsations. 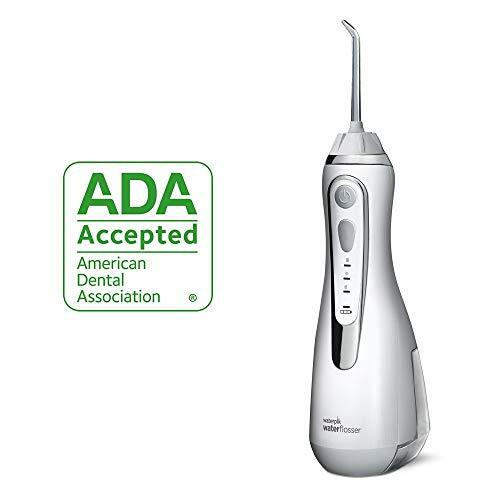 Featuring a new compact and contemporary design, the Aquarius Professional Water Flosser oral irrigator includes on/off water control on the handle, an LED information panel, and 7 Waterpik Water Flosser tips. New pulse-modulation technology provides maximum plaque removal (Floss Mode) and enhanced gum stimulation and improved circulation (Hydro-Pulse Massage Mode), providing exceptional dental care at home. The convenient one-minute timer with a 30-second pacer ensures thorough water flossing of all areas. The Waterpik Water Flosser is essential for good oral hygiene and tooth care. Nicefeel cordless water flosser is an extremely convenient option over traditional oral irrigators. It gives flossing excellence with the convenience of being cordless and rechargeable. It is perfect for removal of food residue between teeth and below the gums, where the brushing alone can not reach. It is excellent at removing hard-to-reach range that can cause bad breath, and tooth decay. GIVE FULL PROTECTION ON YOUR GUM. The powerful pump inside this power flosser generates a rapid pulsating action that targets the areas in between your teeth and removes all of the trapped food particles without damaging the gums, even the most sensitive of gums. [300ml Extra Large Detachable Cleanable Water Tank]: 300ml water reservoir perfect for enough and uninterrupted oral dental flossing without filling in water again and again. It's much easier to clean the it inside of the water tank due to the Open Tank and Detachable Design. With the exclusive patent internal leakproof drainage design, which bring you the safe and more comfortable using experience and extend the item long lifespan. [High Efficiency Improve Gum Health and Teeth Clean]: With 1800 times/minute high pressure water pulse and 4 jet water flosser, 360 rotating long nozzle. The cordless water flosser can powerful cleaning 99.99% food residue every corner precisely that traditional brushing can not reach. Specifically designed for periodontitis, braces. [3 Clean Modes with Memory Function]: Nicefeel cordless oral flossers teeth cleaner has Normal, Soft, Pulse modes for choosing with Low-noise Design, which can meet various oral needs. 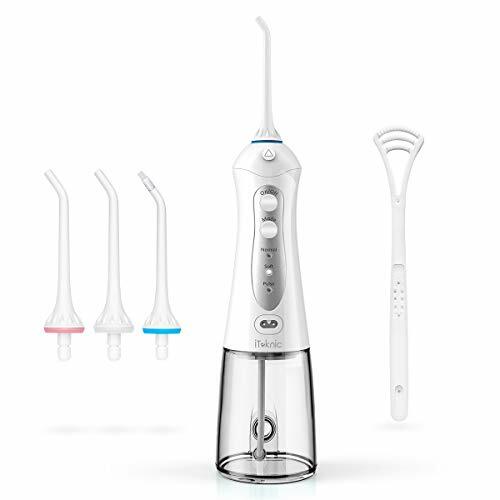 Preset a mode before use and the innovative Memory Function helps keep on with your preferable mode for next use even if the portable water flosser has been turned off. [Powerful Battery with USB Cable and Adapter]: Built-in latest technology lithium battery, the usb rechargable waterpick cordless water flosser will last up to 20 days continuous use after one fully charged in just 4 hours. USB cable and charger adapter are included. 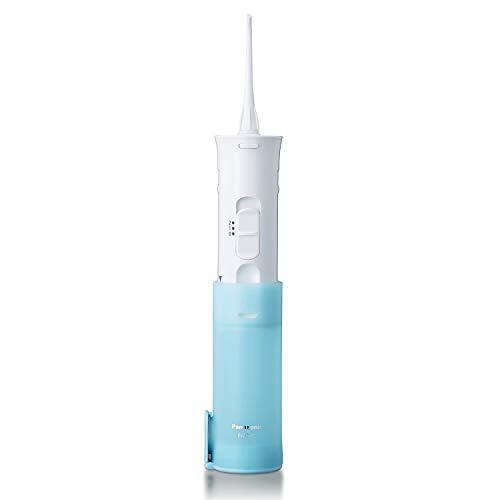 [Cordless & Portable Water Flosser with Tips Box for Traveling]: Portable oral irrigator with a storage bag and extra tips box perfect for carry water flosser and tips while traveling, or use at home,office, hotel. USB cordless water pick convenient for charging on power bank, table anywhere at anytime. Especially been designed to protect your childas dental health by learning health-promoting habits early in life and by helping to keep the between-teeth areas clean and free of plaque. Kids Flossers make the cleaning between the teeth easy, fun, and motivating for child and caregiver. Regular string floss can be difficult to use even for adults. Kids Flossers are small, easy-to-grip handles preloaded with high quality, shred-resistant, gentle dental floss. Crayola Kids Flossers can be used by parents and caregivers to clean between the teeth of infants and toddlers. Young children may start to use Kids' Flossers themselves once they gain manual dexterity. 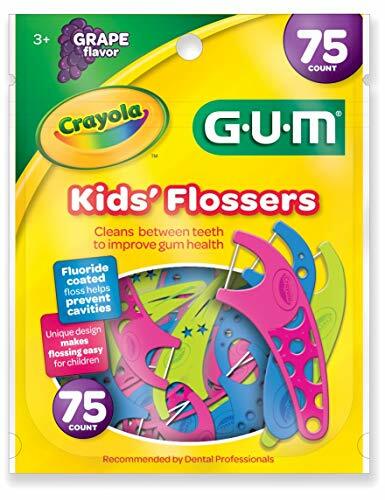 GUM Crayola Kids Flossers are packed in three fun designs and three colors, pink, blue, and greenato build interest and engagement on the tooth cleaning process. All GUM Crayola Kids Flossers have a delicious grape flavor and a fluoride coating. 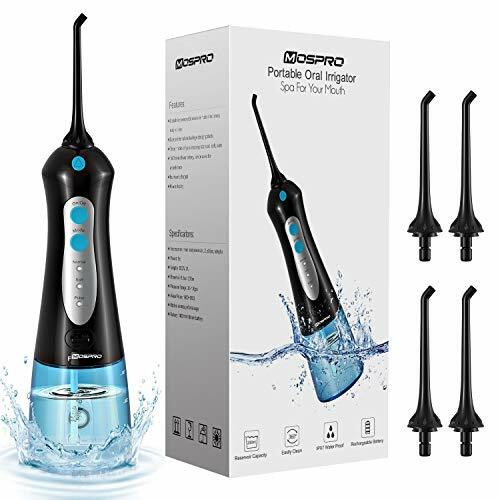 Why Choose MOSPRO Cordless Portable Water Flosser? If you are using this oral irrigator for the first time, please choose the gentle mode; and once you are adapted to it, you may use other modes as you like. If the water flow is obviously weakened during use, please charge it in time (according to the frequency of use twice a day, the charge cycle is about one week). Powerful pulse water: Water flosser supports 3 operation modes (Normal, Gentle, Pulse), delivering a water pressure of 30 to 100 psi, and you can choose your best pressure setting. Water frequency up to 1800 times/minute, quickly clean up food debris and bacteria hiding in your teeth, gum and fissure. Detachable 360 Rotating Nozzle: 2 replacement nozzles allow for multiple users. 360 rotating nozzle provides deep cleaning, and can be used for cavity prevention, plaque control, tartar control, whitening, gum care, and sensitivity relief. Function better when using it for braces, dental implants and Tooth-Sensitive and good for gum Healthy. IPX7 Waterproof Technology Featuring waterproof technology. Ideal to use in bathroom. Enhanced safety is ensured through electric leakage proof design. Fully enclosed waterproof body is easy to clean, without being afraid of leakage. Large Capacity Water Tank: Fills up to 200ml of water from two ports. Avoid the hassle of having to frequently refill the water while flossing. Convenient and Portable: Fill water into the tank, install the jet tip, select the flush mode, turn on ,then you can have a good cleaning experience anywhere like at home, when traveling, on business, at school... Specifications: Water Volume: 200ml Voltage: 100-240VAC 50/60Hz Battery: Lithium Battery 1400mAh Power: 5W Adapter: DC5V,1A Motor Speed: 1400-1800 times/min Charging Time: 4h Modes: Normal, Gentle, Pulse Normal Mode Pressure: 60-100PSI Soft Mode Pressure: 30-60PSI Water Flow: 200ml/min Noise Levels: Waterproof Level: IPX 7 Grade Package Included: 1 x MOSPRO Oral Irrigator 4x Replacement Nozzles 1x USB Charging Cable 1x AC Adapter 1x Instruction Manual 1x Storage Bag Tips: If you are using this dental flosser for the first time, please choose the gentle mode; and once you are adapted to it, you may use other modes as you like. 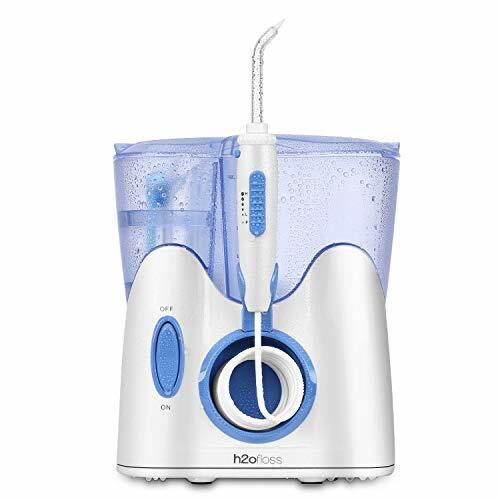 This oral irrigator can be washed directly with water, but taking the service life into account, please do not soak it in water for a long time and keep it dry after each cleaning. The Waterpik Plaque Seeker tip is useful for implants, crowns, bridges, permanent retainers, and restorations. Clinically proven more effective than string floss for improving gum health, the Plaque Seeker Tip is designed to provide the benefits of pulsating water. It has three thin tufts of bristles to access stubborn plaque around areas that are especially susceptible to plaque accumulation. [300ML LARGE LEAKAGE WATER TANK]Extra Big Water Reservoir provides enough and uninterrupted oral dental flossing. Due to the Open Tank and Detachable Design, it's much easier to clean the it inside of the water irrigator tank. Internal Leakproof Drainage Design has exclusive patent, which provides you comfortable flossing experience. 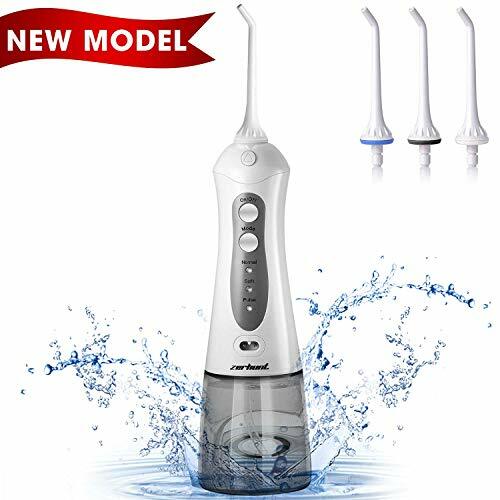 [HIGH EFFICIENCY IMPROVE HEALTHY GUM AND TEETH CLEAN]:With 1800 times/minute high pressure water pulse and 4 jet water flosser, 360 rotating long nozzle,The cordless water flosser can powerful cleaning 99.99% food residue every corner precisely that traditional brushing can not reach. Specifically designed for periodontitis, braces. 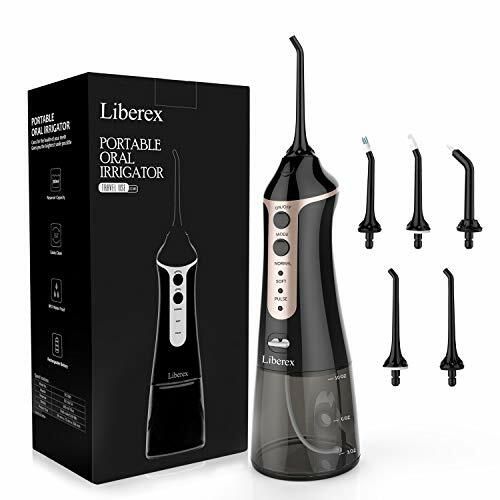 [POWERFUL BATTERY]:Built-in latest technology lithium battery,the usb rechargable waterpick cordless water flosser will last up to 20 days continuous use after one fully charged in just 4 hours. USB cable and charger adapter are included. 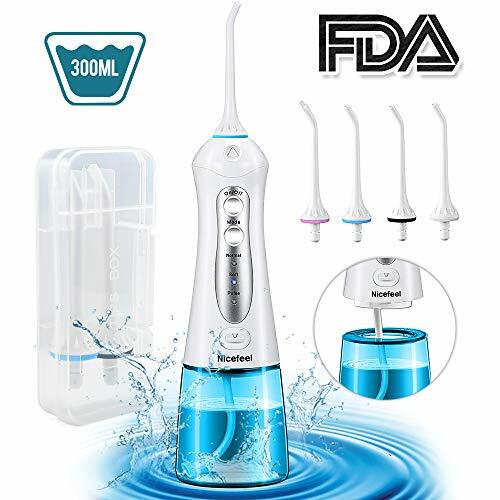 [CORDLESS & PORTABLE FOR TRAVELING]:Portable oral irrigator with a storage bag perfect for fitting in your luggage while traveling, or use at home,office, hotel.Usb cordless water pick convenient for charging on power bank, table anywhere at anytime. [3 FLOSSING MODE]:Normal,soft and pulse mode is selectable for different oral care needs and people. Our cordless jet water flosser has memory function, you can set your favorite mode before power on. Two minutes auto-timer to avoid it still working after you finish cleaning. 2019 NEWEST WATER FLOSSER - Specially Optimized Water Pulse Water Flosser Features. 300ml Upgraded Water Tank Design for Uninterrupted Oral Dental Flossing. Without Fillling the Water Multiple Times. THREE MODE & AUTO-TIMER - Normal, Soft and Pulse Modes With LED Indicators. Choose the Most Comfortable Mode That Suits Your Needs. Soft Mode Is Recommended for First-Time Using. Two Minutes Auto-Timer to Avoid It Still Working After You Finish Cleaning. 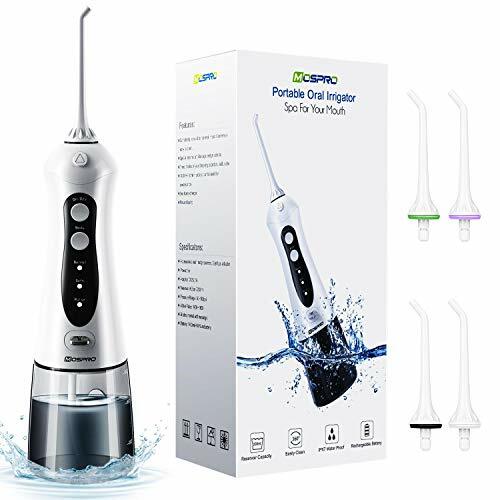 KEEP YOUR ORAL HEALTH -The Dental Water Flosser Provide High Pressure Pulse 1700 per Minute, 30-100psi and 360 rotating Long Nozzle Which Make It Remove Teeth Stain Effectively That Traditional Brushing and Flossing Can't Reach. Just One Minute a Day, Brings You Healthier and White Teeth. PORTABLE & LONG BATTERY LIFETIME: The Powerful Lithium Battery Is Able to Be Used Continuously for 10-14 Days Once Fully Charged in Just 4 hours.No Hassle to Charge Frequently. USB Cable and Charger Adapter Are Included. It's Brings Great Convenience to Your Travels. WATERPROOF DESIGN - The Cordless Water Pick Specially Designed With Internal and External Double IPX7 Waterproof Protection, More Safe to Use for Shower in the Bathroom. All of Our Products Have 100% Refund and Replacement Guarantee in 12 Months to Ensure Customer Satisfaction. DEEP CLEANING - B. WEISS water flosser can be more efficient than brushing and flossing as it can reach every corner and oral point that is difficult to clean. The 360 degree rotating tip of the cordless flosser will perfectly clean your teeth and gums, remove 99.99% of plaque and give you the perfect smile you deserve. 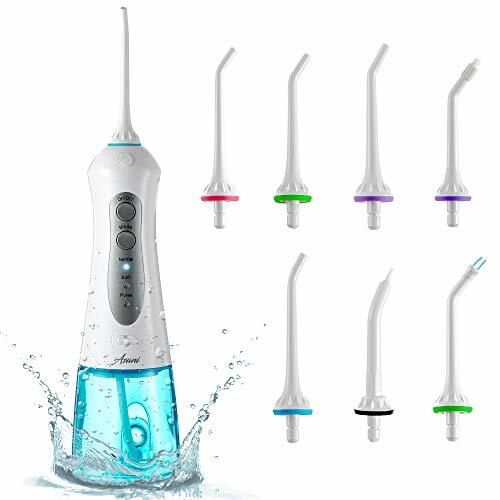 PORTABLE Cordless water flosser, easy to carry, suitable for travel, travel, use anytime, anywhere. B. WEISS cordless water flosser have passed CE, ROHS and FDA certification. We offer 24 hours professional service center, 30 days full refund no questions asked, 12 months quality warranty and 24/7 technical support. STOP ! YOU NEED TO KNOW THIS, WE GOT YOUR BACK. We provide you with a 1YEAR TIME warranty on our product so you can Buy with ease. And we want you to know that for any question or if you just need help, our support team is here for you 24 hours a day. So dont waste your time and click on Add to Cart and enjoy your new water flosser ! The Easier and More Effective Way to Floss, the Waterpik Cordless Freedom Water Flosser is a great solution when you want the convenience of cordless water flossing. Battery operated and portable, it's perfect for use in smaller bathrooms or for travel. The Cordless Freedom dual-water pressure control system allows you to personalize your water pressure intensity. The Cordless Freedom includes 3 AA batteries and an easy-to-fill reservoir. It also comes with a travel bag and a travel plug to prevent leakage during transport. Plus it's waterproof, so it may be used in the shower. 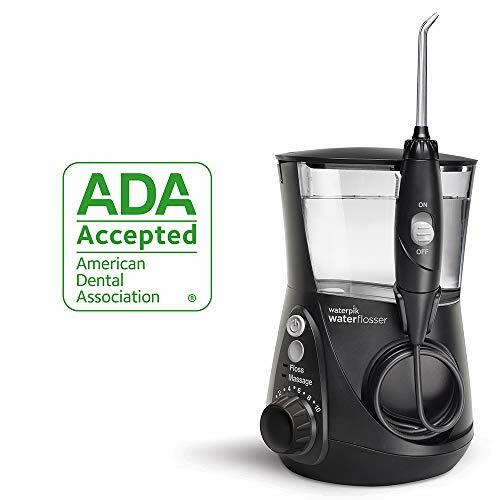 The Waterpik Water Flosser is the first product in its class accepted by the American Dental Association (ADA). Unlike traditional dental floss, the Panasonic Portable Dental Water Flosser and Oral Irrigator EW-DJ10-A creates rapid, targeted jets of water to comfortably and thoroughly help remove food particles, plaque and bacteria from between teeth and gums. This dental water flosser features a smart, collapsible design to fit into tight drawer or cabinet spaces for storage at home and in bags and luggage for use while traveling. By flossing at 1,400 water pulses per minute (in normal mode), this power flosser penetrates deep between teeth to wash away the debris, plaque and bacteria everyday floss can't always reach. These cleansing pulses also reach just below the gum line to remove trapped food particles and help stimulate the gums. To help maintain healthier gums, the cordless water flosser pulse rate can easily be set to two different power flosser speeds; a high-speed pulse for normal, everyday cleaning, and a gentler, lower-speed pulse for children and those with sensitive gums. Either dental water flosser speed provides safe, complete cleaning for those with braces, crowns, veneers, bridges and implants. An easy-fill 5.5-ounce water reservoir in this portable water flosser lets you floss for up to 40 seconds between fills. Cleaning and maintenance for the Panasonic Water Flosser EW-DJ10-A is simple; All flosser parts are waterproof and each can be washed and rinsed thoroughly under the faucet, and dried with a clean, soft cloth. the user can adjust pressure setting or stop it conveniently. Easy to use and 100% waterproof----Plug it in then install tip and filling water, last switch it on, it is IPX7 waterproof. 5-110 PSI with pause position on handle----Choose your best pressure setting and push the sliding bar to the lowest setting to stop water coming out. Convenient design with 800ml large reservior----One side holding the tips and other side holding water, for US use at 110V/60Hz. 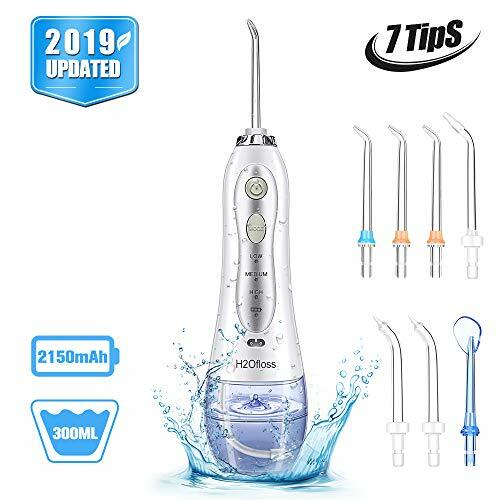 With 12 multifunctional tips----For various use including jet tips, tongue cleaning tips,orthodontic tips,periodontal tips,nasal tips.Kindly note that the presence of the pump & piston and water flow do create some noise, but is normal. 1200 pulses/minute Frequency----The most comfortable frequency according to survey.The machine comes with overheat protection function, it will automatically stop working when overheated, but can be restarted after 2 hours. it can solve your whole family's oral. Water flossing for about a minute a day conveniently removes up to 99.9% of plaque from treated areas and gently massages the gums to improve overall oral health. 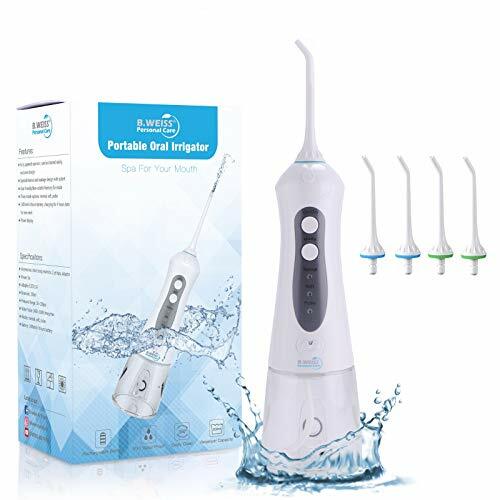 Professional Oral Irrigator - With 1600 times / min water pulse, 360 rotating long nozzle, the powerful water flosser can deeply clean every corner precisely that traditional brushing can not reach. Even for biofilm-thick layers of plaque along your teeth. Specifically designed for periodontitis. 3 Deep Cleaning Modes - Liberex water flosser has Normal, Soft and Pulse modes to meet various oral care needs. The cordless jet water flosser has memory function, you can set your favorite mode before power on. Two minutes auto-timer to avoid that it still works after you finish cleaning. Best Choice for Travel - With durable rechargeable lithium battery, the water flosser will last up to 14 days' continuous use after one full charged in just 4 hours. Come with a USB charging cable, it can be recharged via any USB device: wall charger, phone charger, power bank... (USB charger is not included in package). Portable cordless design, easier to maneuver and it takes up less space and easy to carry, no tangling. Easy to use while traveling, at home or in the office. 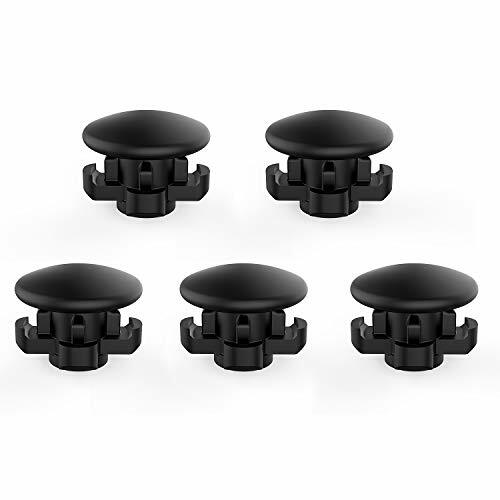 5 Rotatable Nozzles - It's perfect for anyone with braces or implants, and those with crowns, bridges, and veneers, helps clean up the blind spots, remove debris. Professional IPX7 waterproof water flossing to make it easy to clean as well as convenient to use even in the shower. Upgraded leakproof water pick teeth cleaner to avoid electric leakage and enhance safety. Brushing alone is not enough! The Waterpik Water Flosser provides a unique combination of water pressure and pulsations to clean deep between teeth and below the gumline, removing harmful bacteria and debris that traditional brushing and flossing can't reach. It is the first product in its class accepted by the American Dental Association (ADA). 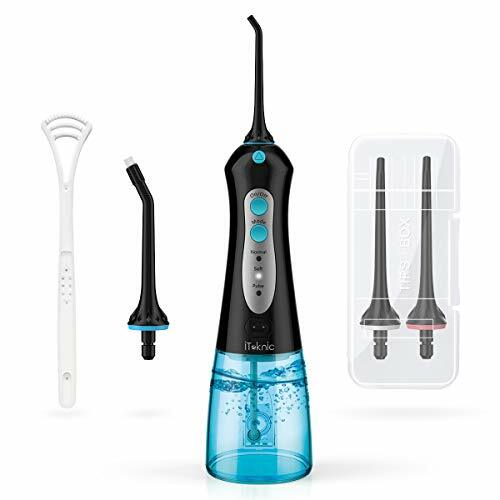 The Waterpik Cordless Advanced Water Flosser is a great solution when you want the convenience of cordless water flossing. Rechargeable, portable, and with an extra quiet design, it's perfect for use in smaller bathrooms or for travel. The Cordless Advanced includes 3 pressure settings allowing you to personalize your water pressure intensity. The Cordless Advanced has a 4 hour rapid charge and an easy-to-fill reservoir. Waterpik Water Flossers are clinically proven to be more effective than traditional dental floss and it's perfect for anyone with braces or implants, and those with crowns, bridges, and veneers. The Waterpik Classic Professional Water Flosser is The Easy and More Effective Way to Floss. It powers away plaque and debris between teeth and below the gumline. Six water pressure settings let you customize gentle-to-deep cleansing, while a spacious reservoir reduces the need for refills. 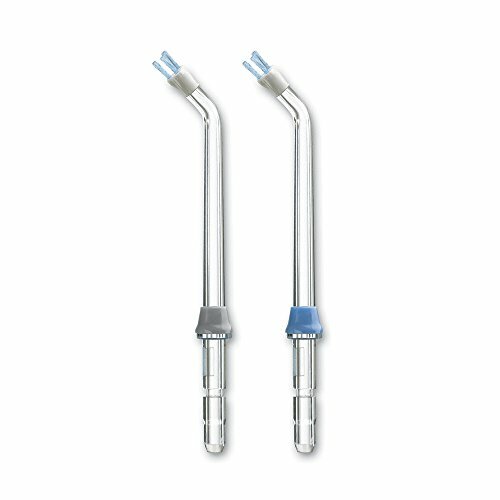 To enhance treatment of gum disease and periodontal pockets, the Classic Professional also includes a special reservoir and the unique Pik Pocket Tip for gentle delivery of antimicrobials and special rinses below the gumline. BerZalah Water Flosser helps you achieve cleaner and healthier oral cavity. We are confident that BerZalah water flosser is the best choice for your oral health. Whether you have gum disease, dexterity issues that makes it hard to floss, you wear orthodontic appliance or have braces, implant, bridges or crowns, or you just looking to shake things up, the BerZalah water flosser is for you. BerZalah Oral Irrigator is perfect for whole family. BerZalah Portable Water Flosser is best for travel, office and home. The BerZalah cordless water flosser is a great solution when you want the convenience of cordless water flossing. Portable and rechargeable, it's perfect for use in small bathroom and travel. 4 hours for fully charge, 14 days for use. 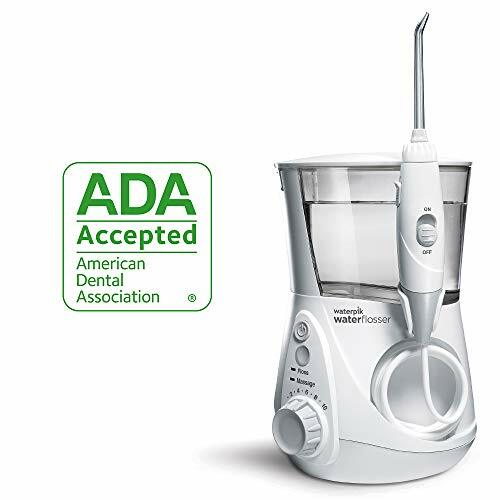 24-month Free Replacement Warranty We are confident that our oral irrigators are manufactured under strict quality standards to give our customers best experience. For any problem, please contact us and we will reply you immediately to solve all of your worries. We offer a 24-month free replacement warranty, totally no risk for your investment. Wider Pressure Range & Mode Memory Function BerZalah cordless water flosser features 3 modes with a wider pressure range of 30-100PSI than common devices, allows you to select a most suitable pressure according to your oral care needs at different section, especially suitable for a long-term oral care. Soft and Normal modes are designed for plaque removal, while Pulse mode is for gum massage and improving blood circulation. Mode Memory function returns to selected mode after turning off. 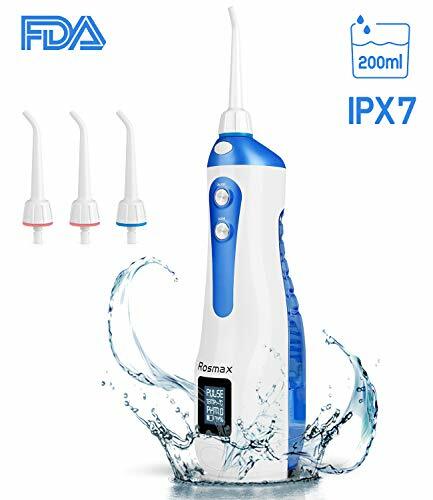 IPX7 Waterproof Rating & Secondary Filtration Thanks to IPX7 water-proof design, BerZalah cordless oral irrigator will be able to withstand immersion in water which means it could be safely used in the shower. Water tank locks to handle tightly and completely prevents leakage. The handle covering anti-skip particles is better to hold when it gets wet. An high-grade double layer filtration net is at the nozzle of the filter inner cylinder making it easier to remove unwanted water impurities. 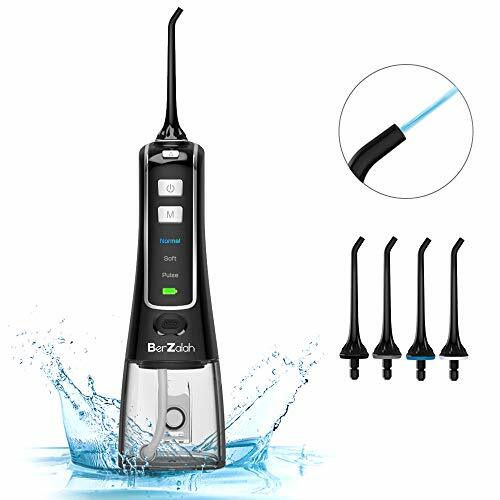 Powerful Rechargeable Battery & Smart Indicator Light Super light weight and USB rechargeable, BerZalah portable water flosser is ideal for travel, or at office and home. No more battery replacement troubles and brings an increase in lifespan. The rechargeable water floss will last up to 14 days continuous use after one full charged in just 4 hours. Equipped with indicator lights, this rechargeable water flosser shows your battery percentage in a clear lights blinking display while charging. Akche Intelligent Cordless Water Flosser Oral Irrigator Product Description. charging and power display, etc. [Efficient cleaning]: With 3 pulse positions, the pulse water frequency can be up to 2200 times/min and the minimum is 1600 times/min (The water pressure range is 40-110 psi). With Normal, Soft, Pulse three modes, each mode can also be timed 2 minutes. With 4 jet water floss and 360 rotating long nozzle, it can clean the mouth efficiently and ensure the mouth is clean. For the water floss, we may not be the most professional, but we are the most attentive. H2ofloss has been developed and produced in the field of water floss for many years. We are aiming at facilitating customers with professional equipment to solve oral health problems. Applying the superior performance pump and top quality motor, whose operating speed is up to 8,000 rpm/min, to help the device plays its best capability. In order to solve the problem of the existing water stream is too small, we have specially developed a water stream of 0.8mm to provide a stronger and more efficient cleaning and massage effect for the teeth. 300ml water tank capacity, which increased capacity by 33% compared to the common 200ml one. It is designed to help you avoid the hassle of frequent water replenishment. 2,150mAh is 53% higher than the common 1400mAh, eliminating the needs for frequent charging and bringing convenience to those who travel frequently. For the HIGH mode, a full reservoir can last 50s, for the MEDIUM is 63s, for the LOW is 80s. If you use each mode twice a day, the unit in HIGH mode status can last 8 days, in MEDIUM mode can last 14 days, in LOW mode lasts 18 days. Even it is portable and cordless, our oral irrigator still can meet a family needs with 7pcs 360 rotatable tips, no matter how old you are. The combination of dental water jet pressure and pulsations can deeply clean between teeth and below the gumline, get rid of harmful things and debris that traditional brushing, air flossing, and string flossing can't reach. Made of Safe ABS Material, IPX7, FDA, LFGB, CE, FCC, RoHS, etc approved. - It is not recommended that the product be used by people with dental ulcers, open oral sores. - Please choose the SOFT mode for the first time use. - Please close the Charging Port Cover before using the water flosser. Daily use of an oral irrigator is suggested by Dentists. McNaval Water Flosser provides a combination of water pressure and pulsations to clean between teeth and below the gumline, removing harmful bacteria and debris that traditional teeth brushes can not reach. 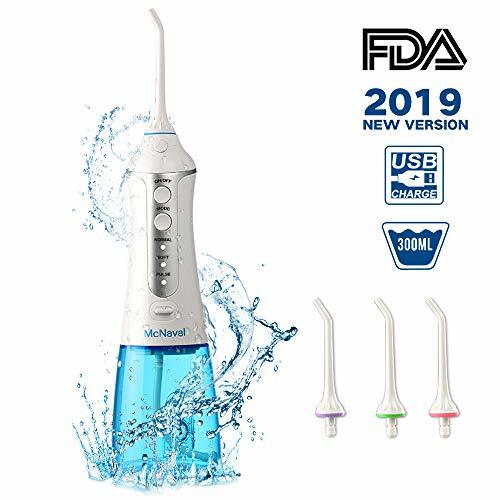 McNaval Water Flosser supports 3 different Modes: Normal, Soft and Pulse, delivering water pressure of 30-110 psi, and water frequency between 1400-1800 times/min, ideal to clean up food debris and bacteria hiding in/between your teeth, gum and fissure. 360 degree rotation jet tips provide deep cleaning, and can deeply remove up to 99.99% of plaque from treated area and gently massages the gums to improve overall oral heath. Fill water up to 300ml which is the right volume for 2-minute used. Water Tank can be fulled-open and removable so its easily clean the limescale and bacteria inside. Innovative Technical Design for internal and external are both IPX7 Waterproof. Safely used in bathroom when showering. Size user-friendly, suitable for Weekend Travel, Long-Holiday or daily used in Office/Home. 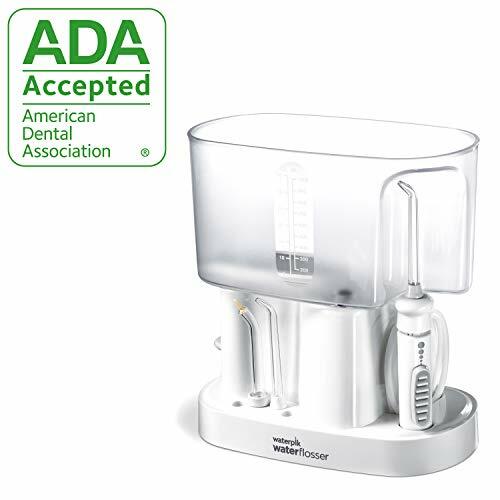 [NEWLY UPDATED LARGE WATER TANK] The updated fully-opened removable water tank allows you to thoroughly clean the limescale and bacteria inside, ensure you are using the clean water/solution, which is impossible for common oral irrigators. [3 FLOSSING MODES with Memory Function] McNaval Cordless Oral Flosser has Normal, Soft and Pulse Modes with LED indicators and Low Noise design. It is an ideal Electric water flosser for Braces, Bridges and others. Preset a mode before use and the innovative Memory Function will keep your preference for next time even its off. [360 DEGREE ROTATABLE JET TIP] McNaval Water Flosser can be more efficient than brushing. It can reach every corner and oral point that is difficult to clean. The 360 degree rotating tip of cordless flosser will perfectly clean your teeth and gums, remove up to 99.99% of plaque and give you the perfect smile you deserve. 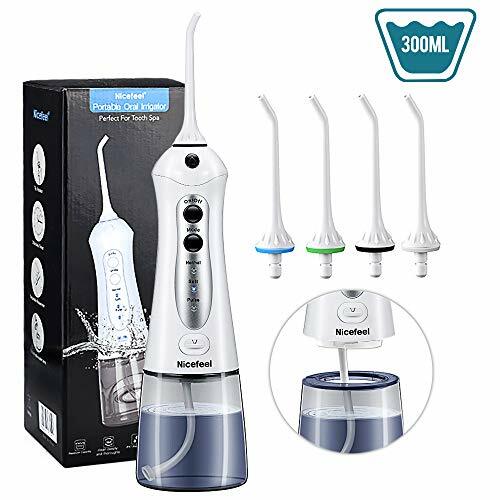 [LONG BATTERY LIFETIME & CHARGING VIA USB INTERFACE] The McNaval rechargeable oral irrigator is with powerful 1400mAh Lithium battery, able to used continuously for 7-10 days once fully charged (around 4 hrs). The USB interface charging design is applicable to a variety of charging equipment, making more convenient. By purchasing our water flosser, you will get 7/24 after-sales support, 45 days money back and 1 year warranty. We are delicate to respond and support to you at 7/24. you get to experience a deep, thorough clean every single time. classic tips also means that multiple users can hygienically use one irrigator. - The 1400mAh battery can last up to 14 days. - Has a 200ml water tank that's 25% larger than others. - Rated IPX7 waterproof for safe and durable use. - The water tank is detachable for easier cleaning and filling. - FDA-approved, leak-resistant, and lightweight. - Great for travel; compact and includes a travel pouch. - Has a 2-minute timer and a memory mode function. - Comfortable handle makes it great for both adults and kids. Get your portable oral irrigator complete with a no-hassle lifetime warranty! GET A DEEPER CLEAN: Unlike other water flossers that struggle to dislodge food stuck between teeth, ours delivers optimized water pressure for a thorough cleaning. It has 3 cleaning modes ranging from 30 to 100 PSI and 1400-1800 pulses per minute. This means a cleaner mouth and fresher breath. 7 TIPS PER SET: Fight cavities, remove plaque, and massage gums the more effective way. Every dental oral irrigator comes with 4 classic tips, 1 periodontal tip. 1 orthodontic tip, and 1 dental plaque tip. Whether you have braces or just want a great clean, you'll have the tip to do the job. USB RECHARGEABLE: You'll love the 1400mAh battery that lasts for days. It takes just 4 hours to fully charge and powers up to 14 sessions. The included USB cable makes charging a breeze. Plug it into an AC wall adapter, your laptop, power bank or car charger and experience the convenience. GREAT FOR TRAVEL: Heading out on a business trip or vacation? Our cordless & waterproof water flosser is designed compact to take up very little space in your luggage. It measures just 8 tall with the tip off, has anti-leak construction, and even comes with a lovely travel pouch to hold all the tools. EASIER TO FILL AND CLEAN: 25% larger than others, our water jet flosser's 200ml tank takes the hassle out of things. You can completely detach it for faster filling and easier cleaning, or use the little opening on the side to fill the tank in the middle of flossing. Get your irrigator and floss the better way. Compatible model: Waterpik WP100, WP260, WP900, WP112, and other brand like VAVA, H2o...etc Work with Other brands water flossers. Please check and see if you have a reservoir with black rubber valve. Replacement Part for reservoir valve/ gasket. Keep your Water pik with factory pressure. Also work with Other brand water flossers. Are you suffering from various oral problems?As an elegant person, white teeth and fresh breath will make you more attractive! Do you want your child to have healthy teeth, and no pain from decayed tooth? Use Water Flosser! Deep cleaning, massage gums, fresh breath, let you bloom with a charming smile! Don't need to keep upright or specific angle to use! Our oral irrigator adopts Soft Siphon and Gravity Ball design, allow you to use it feel freely. This is the ONLY ONE on the market! Built-in 2150mAh Lithium batteries, it can work about 20 days after fully charging. We provide you a quality Storage Bag, convenient to carry, great for work, school or travel abroad. Both inside and outside are adopted IPX7 waterproof, which can be used safely for shower. 300ml water tank to meet your needs. Thicken Waterproof Rubber Ring avoid water leakage during use. ♥Massage the gums, relieve toothache and inhibit gum bleeding. ♥Quickly clean up food debris and harmful bacteria, great for people with implants, braces and orthodontic appliances. ♥High-pressure pulsed water flow remove up to 99.9% of plaque, effectively preventing tooth decay, gingivitis, calculus, and periodontitis. ♥Clean the tongue coating to remove bad breath. 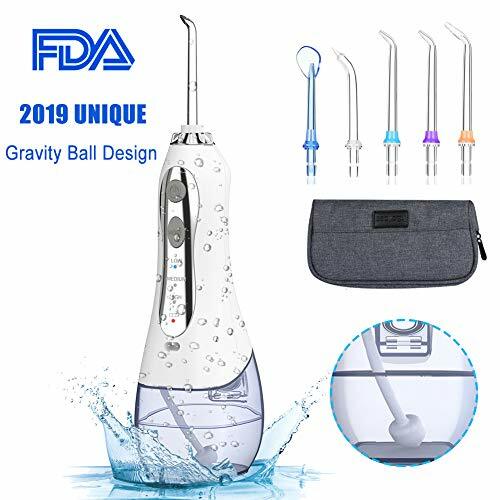 2019 UNIQUE GRAVITY BALL DESIGN Our cordless water flosser is the ONLY ONE on the market. It adopts Soft Siphon and scientific Gravity Ball, this design is similar to baby bottle and allows you to use it at any angle. While other oral irrigator must be held upright or specific angle, or it won't spray water! UPGRADED LARGER WATER TANK Our dental flosser has 300ml water detachable reservoir, you don't need to fill the water frequently. Thicken Waterproof Rubber Ring is better to avoid leaking in using. Ergonomic handle designed, use comfortably and don't worry about accidental touch switch. WATERPROOF & RECHARGEABLR Built-in 2150mAh large capacity USB rechargeable Lithium batteries, 5 hours fully charged can work about 20 days. Professional IPX7 waterproof design and extra Plug Stopple to provide dual protection. Confidently use our water flossing even in the shower. PROFESSIONAL ORAL IRRIGATOR Our dental water jet provide high pressure pulse, can powerful cleaning 99.99% food debris and plaque. 3 modes Pulsed Water Flow and 5 family rotatable Nozzles meet various oral care needs, allow you deeply clean every corner. Just one minute a day, bring you healthier gums and brighter teeth. PORTABLE & QUALITY GUARANTEE High quality cordless teeth cleaner, lightweight, rechargeable, use it anywhere and anytime. We also supply a STORAGE BAG, Best Choice for home, office, hotel, travel, outdoor; Melophy provides 24 months product guarantee. Any problems, please contact us, we will send you a new replacement or give a refund even after the Amazon return window is closed.